A paperless system saves time, prevents errors, and eliminates filing and storage headaches. The RemoteLandlord system allows you to scan and archive images of all tenant documents, such as lease renewals and late notices, as well other documents such as invoices and bank statements, building schematics, and even pictures to document damages. The Filing Cabinet module organizes your documents so Property Managers can quickly find what they are looking for. The Legal Calendar will assist you in dealing with problem tenants by enabling the system to issue alerts whenever it is time to take the next step in the legal process. If a tenant has agreed to make a payment by a certain date, you will be reminded on the expected date. 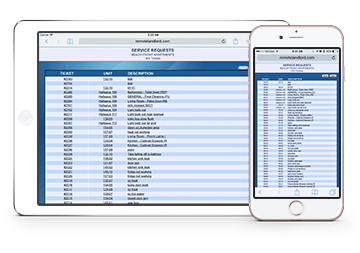 If you have court dates scheduled, the system will maintain the calendar, so all the information you need is easily accessible. The software documents every step of the legal process, and enables you to charge the tenant a service charge for each legal action. The system will generate a court breakdown, and can generate many court forms. 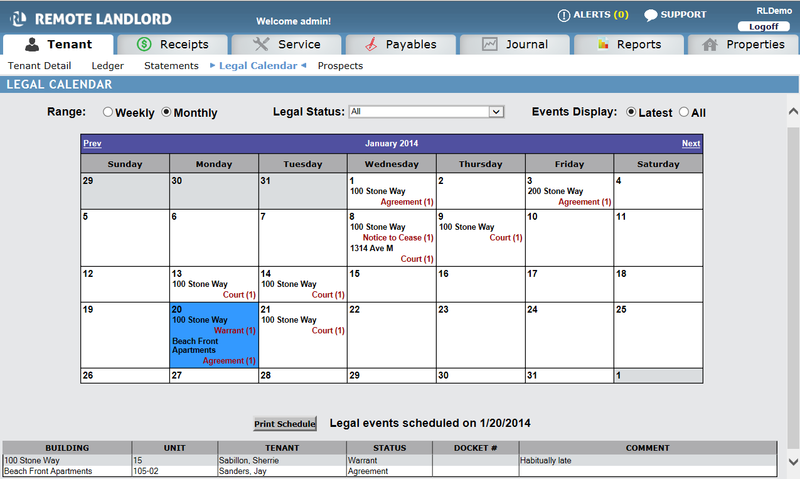 The Tenant Manager module handles the day to day management of each tenant. 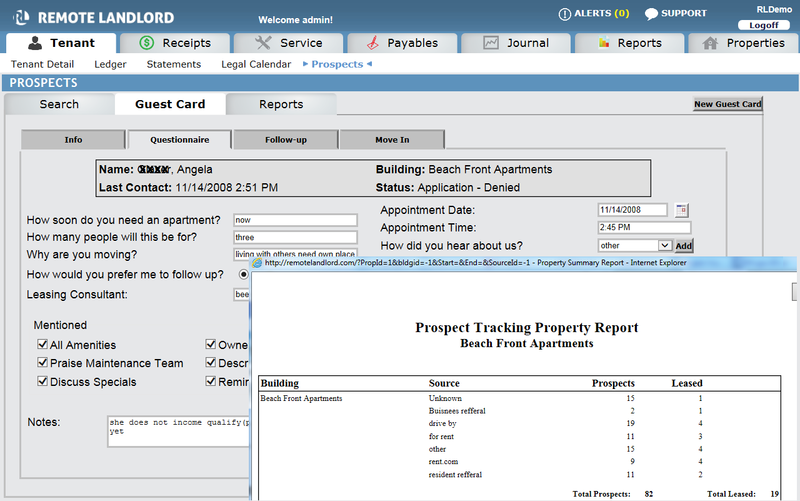 At its heart is a tenant snapshot that tells you everything you need to know about the tenant, in one convenient place. The system tracks each rent component so it can automatically post all recurring charges and print invoices and statements. It will generate leases with increases as per the amount or formula you specify. It also provides an easy mechanism to charge late fees and any other fees or assessments you charge your tenants. 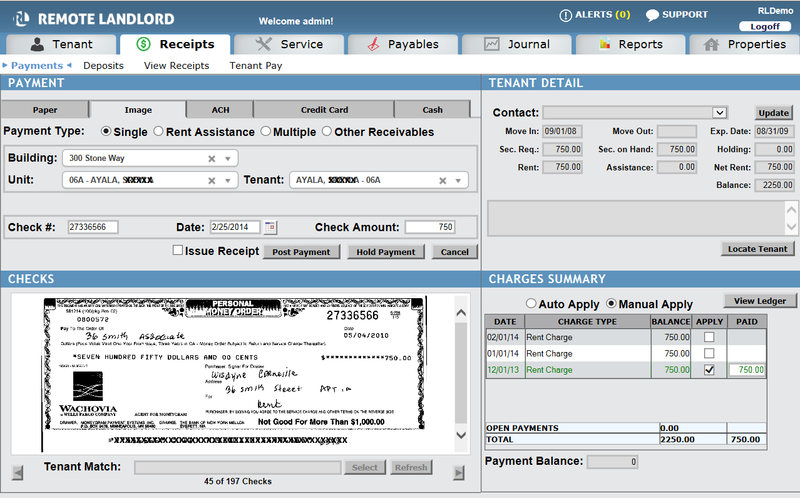 It will track each payment received from the tenant, and will allow you to click on any payment and see an image of the check. 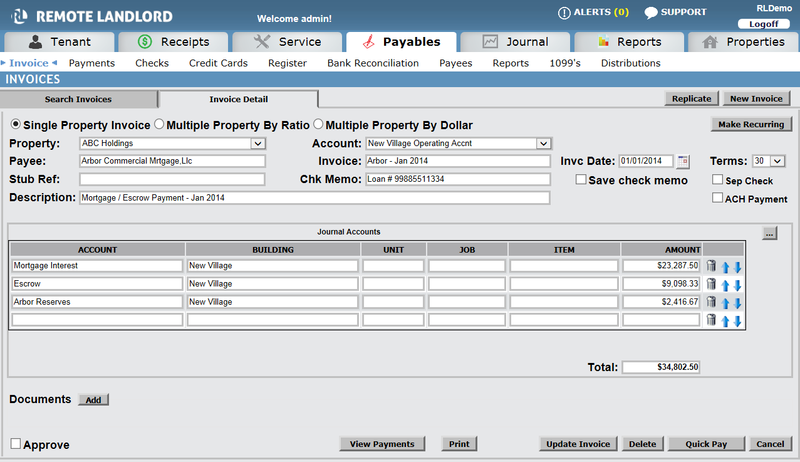 The Cash Receipts module processes all tenant payments and bank deposits. 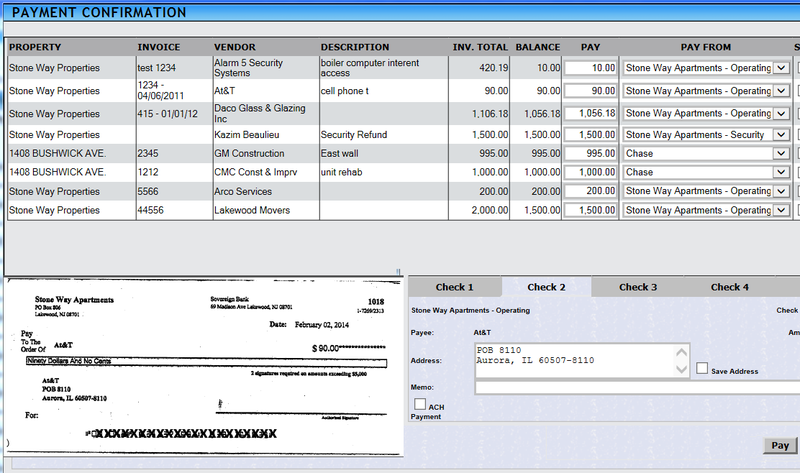 The system archives all check images so you can always click on a payment, and see the underlying document. The system supports multiple payment types, including checks, money orders, credit cards and electronic payments, and tracks which specific charges each payment is applied to. It provides an easy mechanism to allocate a subsidy or program payment among multiple tenants. You can easily search the check database to locate and view any check that was posted to the system, and then see how it was applied. All transactions update the General Ledger to provide accurate financial reporting. 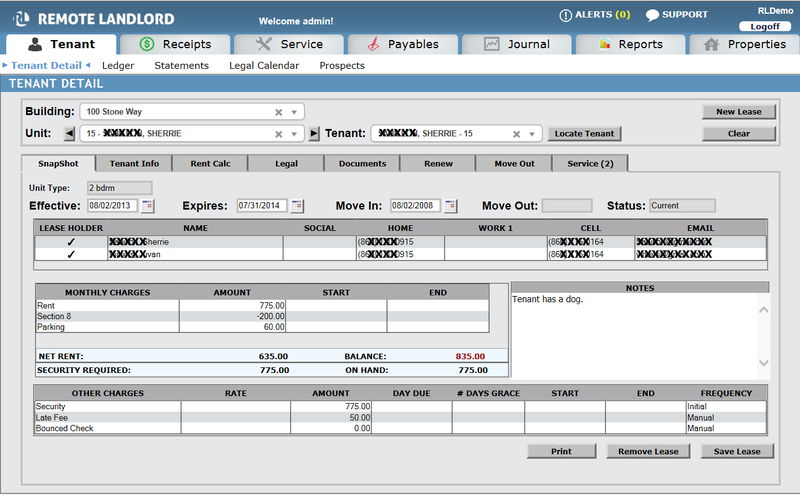 The RemoteLandlord Software has a full Accounts Payable system through which vendor invoices are paid. It enables you to age payables, supports recurring invoices, and provides for a streamlined payment process. The system maintains an advanced vendor database to facilitate easy posting of invoices, and all activity is coordinated throughout the software enabling a quick and easy bank reconciliation. Expenses can be allocated across properties, and you can easily check supporting documents by clicking on the invoice images. The Payables system was designed for Propery Management and has advanced features such as an approval process to support the varying levels of Administration. A robust General Ledger provides enterprise class functionality specifically designed for Property Management. Accountants will appreciate the comprehensive reporting and ease of posting adjustments, while non-accountants will be able to generate their financial statements without any accounting background. All reports provide drill down capability so you can see where the numbers are coming from. Expenses can be tracked on both a building level and a property level, and multiple properties can be merged into an overall P&L. 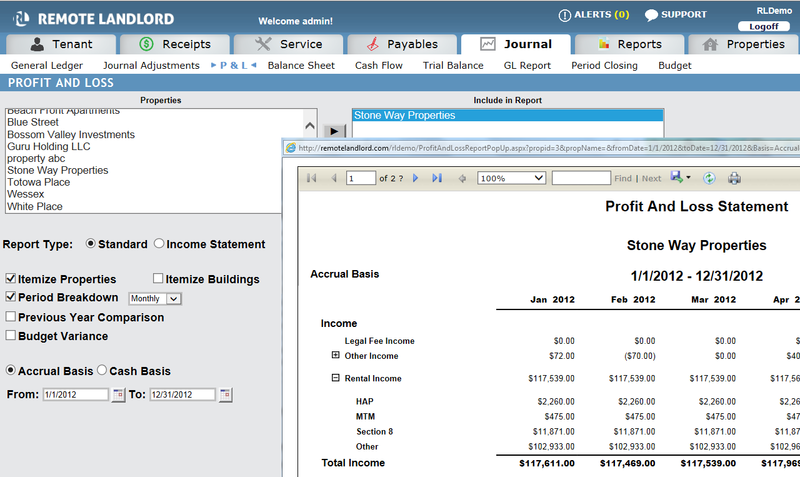 The system provides budget variance reports, and will allow you to compare accounting periods. Optional period locking prevents inadvertent modifications, and audit logs enable you to see who did what and when it was done. The RemoteLandlord System will print MICR encoded checks on blank check stock, eliminating the need to keep separate checks for each bank account. 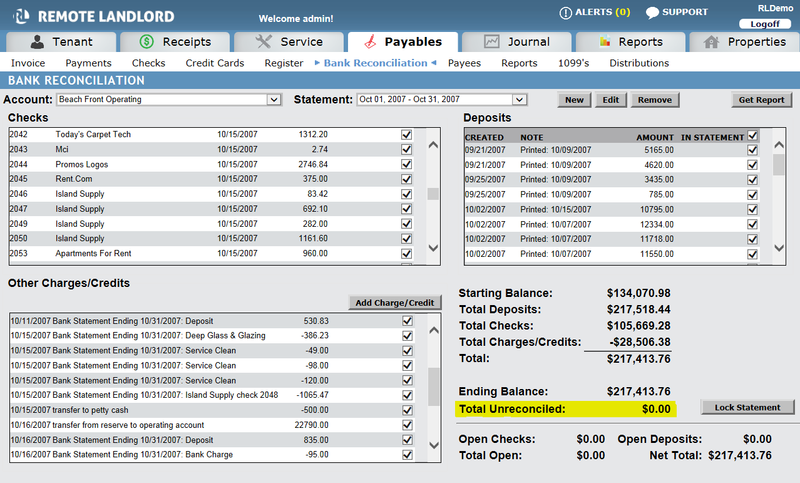 As checks are printed, journal entries are posted accordingly, and all bank activity is coordinated making reconciliation incredibly easy. The Bank Reconciliation module puts your Payables, Receivables and Journal Adjustments together, making it super easy to reconcile everything. Every payment made to a vendor, every deposit from a tenant, and every journal adjustment which impacts the bank account are listed, and by selecting the transactions which are part of the current bank statement, you can reconcile the system with your bank account. The system supports multiple bank accounts per property, and has a flexible chart of accounts which enables detailed expense and income reporting in the General Ledger module. The Prospect Tracker allows information about prospective tenants to be captured, and ensures that follow-ups are scheduled to maximize the prospect's potential. The system produces customized letters, and reports show the effectiveness of sales efforts. When the tenant is ready to sign a lease, the data gets imported into the Tenant Manager module. The software provides a seamless transition from Leasing Agents to Property Managers. The Smartphone module allows you to work virtually anywhere with real time access to your system. It supports most devices on the market today, including Android and iOS devices. Smartphone access is particularly useful when you send a manager to a property as it enables him to get a real time checklist of issues at that property. Being able to check tenant payment history and balance information is additionally helpful when in court. When a resident calls for service, the system logs the request, and then assigns the work order to available staff. The system maintains a database of your workers and outside vendors, each with a list of competencies. Depending on the skills required, the system will suggest appropriate staff or vendors to get the repair done. A monitor dashboard screen shows the progress of work orders in real time, and all open work orders remain highlighted until they are closed. The system will produce work order statistics and reports, as well as worker productivity reports. 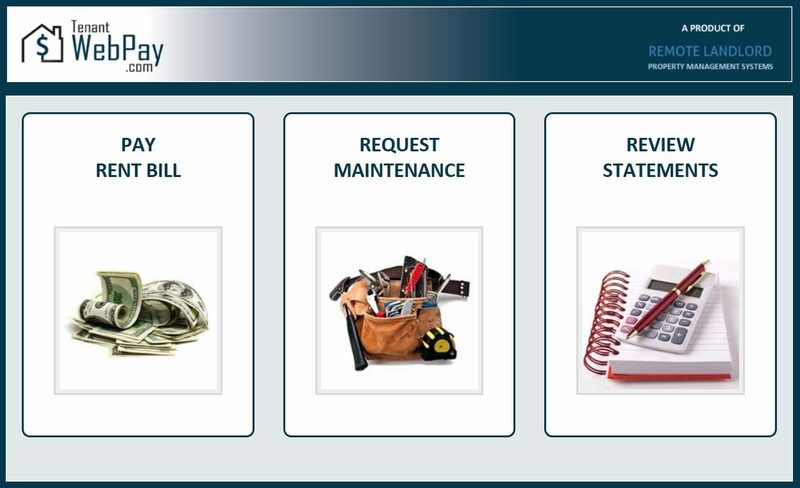 The system will maintain an appointment book for your maintenance staff, and you can easily see who is working on what. The system tracks appliances and automates inspections so that work orders are automatically generated for any needed repairs. The tenant portal allows the tenant to retrieve their current balance, get a copy of their current rent bill, and enables them to make electronic payments via ACH or credit card. These payments are fully integrated with the system and are credited directly to their accounts. 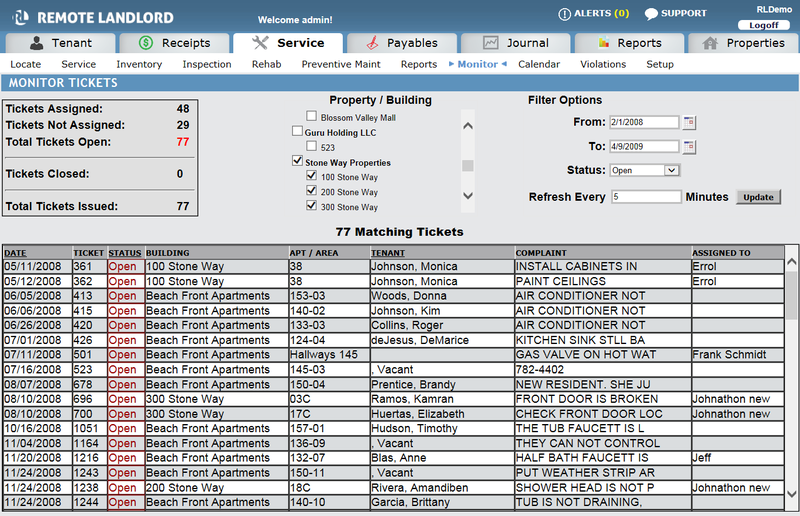 This saves Property Managers time, allows for quicker payment, and easier reconciliation. A configurable option also allows the tenant to initiate a service request. 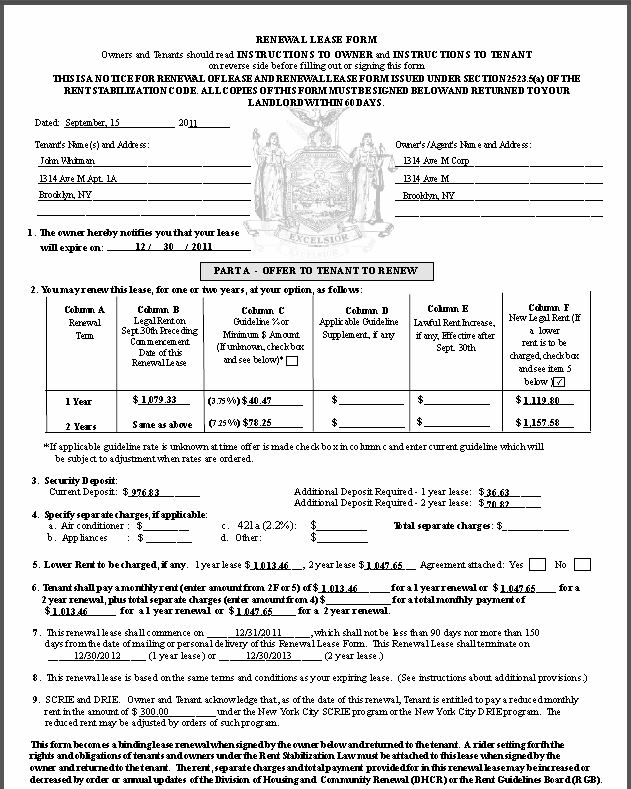 The NY Rent Stabilization module provides full DHCR support. 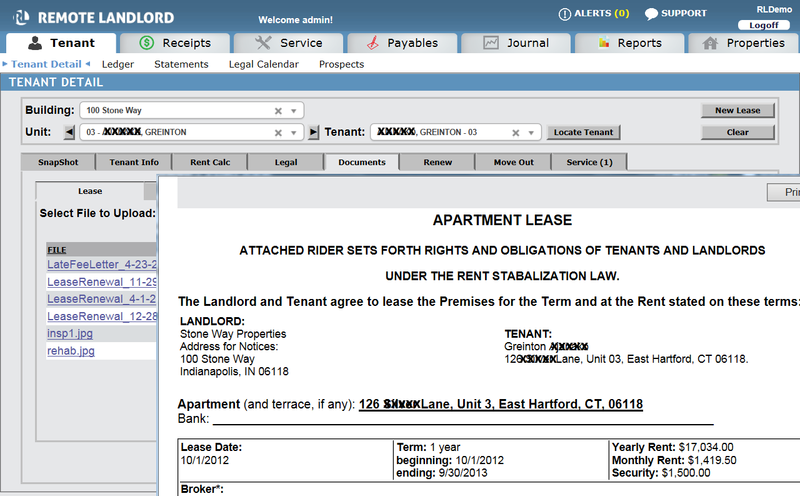 It automatically calculates the maximum allowed rent increases and generates the RTP-8 lease renewal form and NY riders. Preferential rent, MCI and Rent Reduction Orders all propagate to the appropriate forms, and the DHCR Module provides annual electronic filing as per DHCR guidelines. The system is regularly updated to keep current with DHCR regulations, and is automatically activated based on the property zip code.